Pumpkin Granola Trifle - A recipe from Savor California, the online showcase for extraordinary gourmet foods and beverages from California. In a bowl, mix pumpkin, cinnamon, nutmeg and cloves until smooth. In a second bowl, whip egg whites with an electric mixer until soft peaks form; add ½ cup sugar and whip until stiff peaks of meringue form. Gently fold pumpkin mixture into meringue until just combined. In a third bowl, combine sour cream and remaining 1 tablespoon sugar. In each of four 5-ounce glasses, divide and layer half of Ginger Pecan Granola and half of pumpkin mousse; repeat layers. 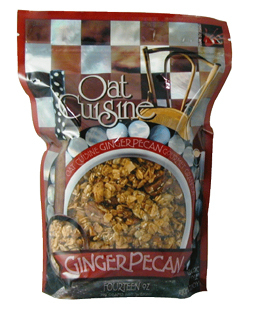 Top each serving with 1 tablespoon sweetened sour cream and sprinkle with granola.